Breakfast included, lunch and dinner on request. “Why will people love staying in your hotel? 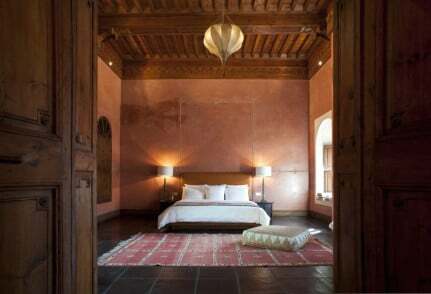 The riad blends refinement, comfort, elegance, style and intimacy. It is ideally situated, has gorgeous views, sumptuous bedrooms and a wonderfully friendly staff to make it a true home away from home. The riad is located in a particularly elegant area of the bustling, vibrant medina. It is a stone's throw from the souks and a short stroll to the legendary main square. There are excellent antique shops and superb restaurants within walking distance, but ultimately the riad's tailored service can organise anything from hiking trips to quad biking to cooking classes to hot air ballooning. Anything is possible! A fusion of continental and Moroccan flavours taken either on a sunny terrace, a shaded courtyard or in the rooms. Elements of the breakfast change daily and the finest Italian coffee is served. We have 5 individually decorated rooms each with their own distinct character. Leale is a particular favourite as with its own private courtyard, it feels like a riad within a riad.